An average kayaker with a suitable kayak and a reliable roll can have fun playing on surf which is anything from 60 cm to 2 metres high. Surf always looks a lot bigger from a kayak than it does from the car park, and 2 metres feels really big. You can spend years of winter weekends on Atlantic surf beaches and never see a wave more than 2.5 metres high except during a gale. Pacific surf beaches get the occasional winter day of colossal waves, 4 metres and more. For good surf, you want a beach with a shallow gradient. If you want big surf in Europe, go to beaches which face west over the ocean like Sennen (England), Biarritz (France) or Essaouira (Morocco). They are on the lee side of westerly winds which blow unobstructed across the Atlantic. The length of fetch is therefore hundreds of kilometres and the wind has many days to build up a good swell. If you want big but friendly, look for beaches which are on the lee side of an ocean and exposed to it, but do not directly face the approaching waves. That description fits many beaches on the Atlantic coast of Europe which face north or south. There are many good beaches on the south coast of Devon. Mundaka beach in the Basque country of Spain faces north and claims to have the world's longest surf break. 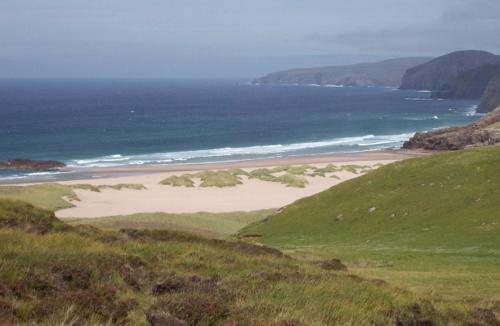 Some of Europe's best surf is on the empty, lovely west coasts of Ireland and Scotland. Because the weather is harsh in winter and often grey in summer, neither region is exactly overcrowded. Ireland has a population of 4.5 million and Scotland 5 million, and most of them live well away from the Atlantic coasts. England's best surf beaches are in Cornwall, a region shaped like a long spearhead pointing south-west into the Atlantic. The largest waves are at the tip of the spear, at Lands End, where Sennen beach faces directly west. Stand on the cliff in stormy weather and you will see parallel lines of swell waves march in from the west, steepen in shallow water and explode on the beach. The beaches on the north coast of Cornwall face north-west and waves there are often large, sometimes very large. The south coast faces directly south, the surf tends to be small and is mainly created by local weather. While you're walking down the beach, have a look at the waves and find the easiest place to launch. To go afloat, do a seal launch. Place your kayak at the water's edge, pointing out to sea, get in, fit your spraydeck and use your arms to slide it into the water. Keep your kayak pointing straight into the waves. If you are not at 90 degrees to the waves they will grab the front of your kayak, turn you sideways and shove you back up the beach. Most of this page is about surfing for fun but here we’re thinking defensively. You’re at sea, you’re cold and tired, and you don’t like the look of the surf hitting your beach. How about this, for example? But there you are, in your kayak at sea, looking towards the beach, and in between is the back of a surf line that you don't want to get involved with. You can see muscular wave backs shouldering up, leaning forward and falling with long streaks of foam and rumbling clouds of spray. Stay well back from the surf line because occasional bigger waves will break 20 or 30 metres further to seaward. It may be easier to go to a different location to get out of your kayaks. There is probably another beach just round the headland which faces the waves less directly and so has much less surf. There may be a harbour nearby. And i f you are surfing down the face of a steep wave and the front end of your boat starts to dig into the water, lean your body backwards if you don't want to do a "pearl dive" and forward loop. Or forwards if you do. Again, see below. In beach surf it may be a different story. If you are surfing a playboat or a surf kayak you can retain control, choose your direction of travel, make rapid course changes like a skier, loop round an obstacle, or travel diagonally along the wave until you reach a low point where you can paddle back out to sea. In a five metre traditional sea kayak you can't do any of those things, you can just go straight and fast to the beach. A sea kayak is very fast so you may outrun the wave. Then when it breaks you are a few metres ahead of the washing-machine turbulence of the break, you stay dry and upright, and you get a jet fighter boost to your speed. 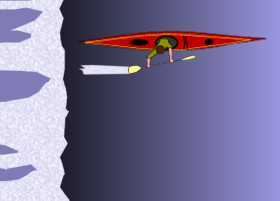 There are some modern sea kayak designs which have a flattened underwater shape instead of the traditional deep, axe-shaped bow. The idea is that you keep control when surfing steep waves. It really does work very nicely in surf, being both fast and manoeuvrable. However it may give you a noisy, splashy, wet ride on flat water unless the sea is dead calm. It can be a bad idea to catch the same wave as another sea kayaker. If you and your friend are twenty to thirty metres apart on the same wave when each of you starts a sweeping high-speed turn towards the other, you will soon be closing with a combined speed of 60 km/h and it is quite likely one of you will end up as a kebab. Back in the days of taking fibreglass slalom kayaks into big surf your editor had a head on collision with a friend's boat at Saunton. Luckily this was also back in the days of surf kayakers wearing Mae West type lifejackets with a thick pad of foam on the chest, but he can still remember spending the next week sleeping in an armchair because lying down made his ribs hurt too much! 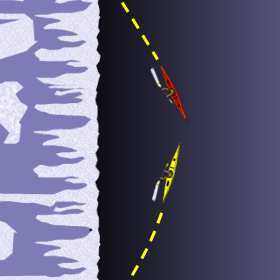 On a breaking wave, any boat has a strong tendency to rotate until it is parallel to the wave (broach) and a kayak will then bounce towards the beach sideways, in the grip of the wave. This is called a sidesurf, broached run or bongo slide. In a short playboat or surf kayak you can quickly regain control. 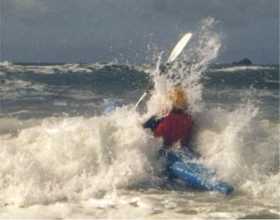 In a sea kayak you may be unable to regain control until the wave lets you go near the beach. It may have occurred to you that a sea kayak is about 5 metres long, so if it's vertical in the water the front may be 2 metres under the surface. Is there usually that much depth of water in surf? Well no, there often isn't. The bottom end of a vertical sea kayak may land gently on the sandy sea bed in such a way that you gently polevault over it as in this photo. The risk in big steep surf is that it may slam into the sea bed with spine-jarring force and, if you have a composite or plywood sea kayak, snap it in half just in front of the footrest. If you feel like a surf session you can take a polyethylene kayak; or a surf kayak; or play somewhere waves form up, give you a fast run and then fade away again into deep water; or visit a deep water playwave. The length and low rocker of a sea kayak prevent it conforming to the concave face of a steep wave but most kayaks, of any length, will pearl dive in surf. Your editor spent his college years surfing 4 metre fibreglass slalom kayaks in north Cornwall, looping on every other run and breaking two or three boats a season. When the club re-equipped with Dancers which were 3.5 metres long and had more rocker, they were slower on flat water but it was suddenly possible to choose whether to loop just by leaning forwards or backwards at the critical moment. Then along came the short, flat bottomed Moccasin surf shoe and suddenly you had the speed to out-run a wave. See Kayaks For Surfing. • Try to steer to one side or the other. Works well unless it makes you broach because then you'll still be heading unstoppably towards the beach but now clearing a swath 5 metres wide. Then again, you're not going to cause any real damage if you run somebody over while going sideways. White-water kayakers are used to surfing standing waves on the river and most of them occasionally take their playboats and go surfing at the beach. They catch a green wave and go straight towards the beach, using their paddle in a stern brace for support and to steer at a slight angle to right or left. When the wave breaks, they often do a forward loop, land upside down, roll and go back out to do it again. Playboats loop much faster than sea kayaks but you may have time to turn a loop into a pirouette. If somebody goes for an accidental swim, another kayaker can sometimes tow or push the casualty out to sea for a deep-water rescue or do a lightning-fast rescue within the surf zone. See Towing and Deep-Water Rescue & Self-Rescue. It is usually best if the casualty swims to the beach. If that's you, keep hold of your paddle and one end of your kayak. If your kayak has bulkheads and/ or full buoyancy bags you will find it easy to swim it to the beach. Each breaking wave will push you in that direction. If you don't seem to be making much progress you are probably in a rip current heading directly out to sea. Swim parallel to the beach until you are out of the rip, then swim to the beach. Stay on the seaward side of your flooded kayak, especially when the water is only knee deep. A flooded kayak weighs more than 100 kg. The best waves for board surfers are the best waves for kayakers, but we can also get a lot of fun from surf which is no good for board riders. It is often worth going to the other end of the beach where the break is smaller or messier, or where there's a strong longshore current or a strong flow from a river mouth, or where waves are breaking on a reef and so are more attractive to a kayaker (in helmet and body armour) than to a board surfer. We can also surf at one of the many beaches which have no car park but which are a ten-minute paddle from a beach or harbour. In Britain alone there are thousands of lovely little coves with perfect surf beaches. They're underwater at high tide but the only conflict is when a peregrine falcon takes out a pigeon.